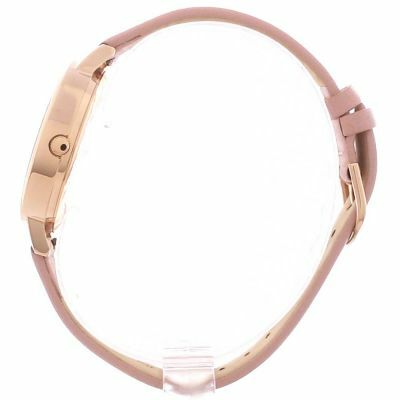 Olivia Burton Wonderland Gold & Dusty Pink OB16GSET23 is a beautiful and attractive Ladies watch from Wonderland collection. Material of the case is Stainless Steel while the dial colour is Rose. We ship it with an original box and a guarantee from the manufacturer. The Olivia Burton watch collection has gained a cult following thanks its vintage-inspired designs. Olivia Burton watches are available with a small 'midi dial' or large 'big dial'. This variety in size means watch-lovers can choose between a statement piece that makes an impact, and a small watch that adds subtle detailing to an outfit. At first glance, the range of watches may appear simplistic, but thanks to Olivia Burton's obsessive attention to detail, they're anything but. The simpler watches feature soft metallic hues coupled with pearlescent faces for a glossy finish. Statement designs showcase a pure love with all things traditionally British. The countryside is beautifully represented with bold images of fauna, while British classic Alice in Wonderland is used to inspire a fantastically stunning range. Lovers of vintage and British style should look no further than the Olivia Burton collection. Watch Shop is an authorised Olivia Burton stockist. Sign up to receive email updates when new styles of Olivia Burton are added to Watch Shop!